Tuberculosis, also called TB, is a deadly infectious disease and is caused by a bacterium called Mycobacterium tuberculosis (MTB). This disease mostly affects the lungs but can also attack other parts of the body, for example the central nervous system, the lymphatic system, the circulatory system, the genitourinary system, bones, joints and even the skin. MTB is a slow-growing aerobic bacterium that divides every 16 to 20 hours; in comparison, other bacteria normally divide in minutes. One should know that there is a difference between being infected with tuberculosis (latent stage) and having tuberculosis disease (active stage). An infected person has the TB germ or bacteria in his body, but his immune system is strong enough and will protect him from becoming sick. The infected person cannot transmit the infection to another person. A person who has the TB disease is sick and is capable of spreading the disease to other people. The TB disease is spread from person to person through the air. It is normally spread when a person coughs, sneezes, speaks, kisses, or when using unsterilized eating utensils of an infected person. Usually this infection is passed on as a result of very close contact. Tuberculosis is usually spread between family members, close friends and people who work or live together. Cough is the most common symptom of tuberculosis. Because the disease develops slowly you may not notice any other symptoms of illness until the disease is quite advanced. TB mostly affects the lungs and in the beginning the symptoms can be easily dismissed as a cold or flu. 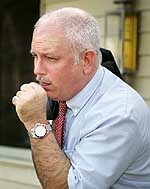 The symptoms will increase and the cough may start to produce a small amount of green or yellow sputum in the morning. Sooner or later, normally after three or more weeks, the sputum may be marked with blood, although large amounts of blood are rare. Following the coughing, the person will experience chest pain and night sweats. It is possible to awake at night drenched in a cold sweat and often the person has to change clothes or even the bed sheets. However, these night sweats are not specific to tuberculosis. Other symptoms are chills, fever, fatigue, loss in appetite, unintended weight-loss and a general feeling of being unwell or sick. If left untreated the disease will spread into the lungs and the person will also experience shortness of breath. Often the first routine screening tests are chest X-rays, the tuberculin skin test or a sputum sample test. The sputum sample is examined under a microscope to look for tuberculosis bacteria and used to grow the bacteria in a culture. The microscopic examination is much faster than a culture but is less accurate. Definitive diagnosis requires growing the bacteria and confirming that the culture is MTB with biochemical tests or DNA probes. This can take several weeks. Smears that give a negative result initially can produce a positive result in a culture weeks later. A combination of antibiotics successfully treats the infection in the majority of cases. But because tuberculosis bacteria are very slow growing, the antibiotics must be taken for a long time — usually for 6 months or longer. Treatment must be continued long after the person feels completely well, otherwise the disease tends to relapse because it was not fully eliminated. Even with treatment, some people develop long-term complications from infection. Travelers to countries where TB is prevalent are at greater risk of the infection. A vaccine is available and is offered to those at high risk of contracting the disease.